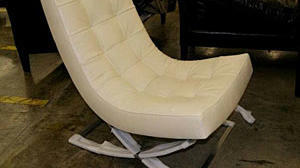 We’ll feature a pair of these retro-style chairs in creamy white leather in the Master Bedroom. Luxe seating for enjoying the hillside views! I’ve got to confess, I have a chair fetish. Some people collect stray animals, I collect stray chairs. So, when I lucked out this past spring and got to go to the High Point Furniture Market in North Carolina—a bucket-list kind of place for furniture fiends like myself—I couldn’t wait to hop on that cross-country flight and get the ultimate fix in all things home furnishings. Topping my list of must-see showrooms was LEE Industries, which is providing all the upholstered pieces for the Sunset Breezehouse. LEE is a family-owned business and all their furniture is handcrafted—using earth-friendly materials and practices—at their facilities in North Carolina.